Sausage Saloon Franchise assists landlords in enhancing their tenant mix with this exciting concept that provides a new dimension in the franchise fast food industry. It also caters for people from all walks of life. A concept that is not only new to the franchise fast food industry, but also provides an affordable quality product to the customer. Low demands in terms of tenant requirements allow flexibility and ease of placement of a Sausage Saloon Franchise concept at any venue. 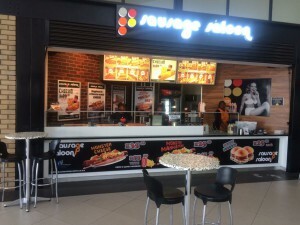 Sausage Saloon Franchise Diners require space of between 25 to 50 square meters, in malls of successful centres where passing trade is maximized. The ideal shop front is 4 linear meters in order to capitalise on the bright and colourful impact that the store has to offer. A small area for tables and chairs creates a ten-minute seating area for customers. Sausage Saloon’s Fast Food Franchise are able to trade wherever there is high volumes of passing trade. We have a concept for almost any location. Franchisees can also add on to their existing stores with mobile options for their surrounding areas. We have a solution for all Office Parks, Garages, Schools, Golf courses and any canteens. From our “New York Styled” hot dog mobile unit, our 2m long trailer equipped with gas fryers to our Counter Buddy units, we can tailor make the correct solution to serve customers a world class meal. All Sausage Saloon fast food franchisees will undergo training conducted by the franchisor to ensure all operating standards are maintained and that you get the full benefit of the franchisor’s experience and know-how. We expect all franchisees to be hands on and share our passion for our brand. Delivering quality service in all aspects of the business. © 2016 Sausage Saloon. All rights reserved.